Currently the video is not available. In January 2013, Rwanda launched a new strategy to attract more visitors from emerging countries such Russia, China or India (you can read an article published in January 2013). This video directed by Russians filmmakers will certainly boost the promotion of Rwanda in Russia. 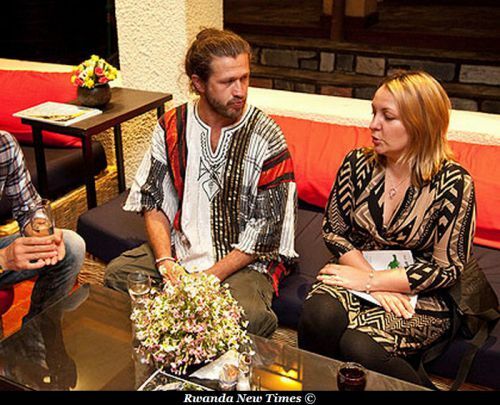 In November 2012, Rwanda New Times meet the two filmmakers, here is the article. A team of Russian filmmakers who have been in Rwanda for ten days filming Rwanda’s tourist attractions have promised to market the country by screening a documentary on several television stations in Russia. Speaking to The New Times at a dinner gala, the crew expressed excitement over their time in Rwanda, saying there was much about the country that the world doesn’t know. “For eco-tourists, this is the place to visit,” said a producer on My Planet channel, Tatynana Tertyhnikova. She added that the safety of tourists and the attractive landscape were key to attracting tourists. My Planet belongs to the All-Russia State Television and Radio Company (VGTRK), Russia’s main state television group. It was launched in 2009 as Russia’s first TV channel dedicated to travel, science and history. Andrey Ponkrhtov, a presenter on the same station, said that the documentary they filmed will be called, “A country with no plastic bags”. My Planet programmes are also screened by Russia 2 and Russia 24 (two of Russia’s main channels). My Planet TV is available free by satellite across Europe which Rwandan officials say was a good opportunity of market the country in Asia and Europe. In 2011 the channel announced the My Planet Travel Awards with the aim of celebrating the most popular destinations, resorts and services in the eyes of Russian tourists. Rica Rwigamba, Head of Tourism and Conservation at Rwanda Development Board (RDB), said Rwanda’s tourism has the potential of attracting tourists from across the world and that to date, Russia is one of countries that Rwanda is targeting to diversify the tourism market. “There is increasing number of Russian tourists flocking the region and that is why Rwanda needs to tap into this. With these documentaries about Rwanda, there is no doubt the number of tourists from that part of the world will increase,” said Rwigamba. She added that the Russian crew filmed not only the touristic destinations in Rwanda but also social and developmental attractive projects in the country. The chairman of Rwanda Tour and Travel Association, Manzi Kayihura, said that having Rwanda featuring on Asian and European television was enriching the Rwanda tourism sachet. “We need to realise that the tourism industry is growing rapidly worldwide and Rwanda should be one of the key beneficiaries,” he said.